Qualities: The seat of the soul. Connection to the Highest Self. Enlightenment. Unity. Elevation. Relationship to the Unknown. Shadow: Grief. The feeling of being separated from existence and from abundance. Fear of death. Yoga: Sat Kriya, concentrating on the tip of the nose. 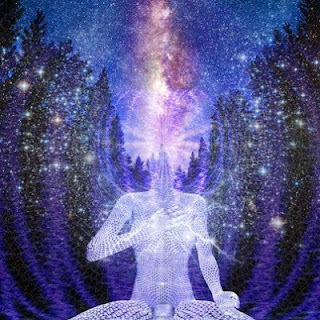 The pineal glad is associated with the Seventh Chakra, the Crown Chakra. 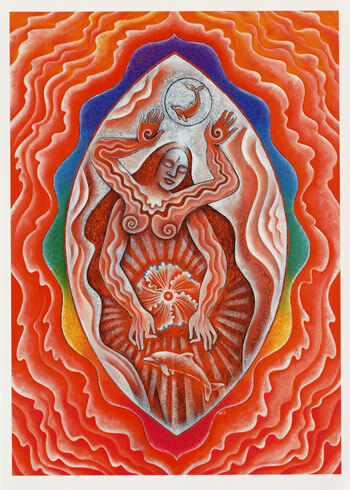 The Seventh Chakra is associated with cosmic sound. The Seventh Chakra has the key characteristic of surrender (the humility that fills you as you bow before the infinite). That is one of the reasons that so many different traditions use the act of bowing. Remember you can be just as crazy in the astral realm as on the Earth. Just because you are dead doesnt mean you are stripped of your ego. Greetings Rhythm & Breath Yogis! What better way to celebrate the full moon than with a meditation for abundance! This meditation is comprised of three parts. You are going to need an orange/tangerine for the second part. So go ahead and get that orange...I will be waiting right here. Begin by sitting in easy pose, with your legs crossed, or if this is painful, you may prop your knees up with pillows or sit in a chair. You are going to rub your hands together (stimulating the 72 thousand meridians in your hands connected to your brain) and bring them into prayer pose right in front of your sternum. We begin every session with the ADI MANTRA which is chanted on two breaths 3xs. Remember chanting is NOT singing...it is incantation for the purpose of entering into trance states. It is mono tone, droning and soothing. Think of it as a heart beat but it's your own...not your mamas. Isnt that beautiful? All a part of our re-parenting our selves! Which means, "I bow to the Divine Teacher within." Make a fist with the left hand and the right hand wrapped around the left hand hugging the fist. Place the mudra 7 inches in front of your heart center with the palms facing down. Breathe long and deep for 17 minutes. Focus on your third-eye. Take your orange in the left hand with the right hand wrapped around the left hand holding the orange. Palms facing down right in front of the heart center like in part one. Breathe long and deep for 7 minutes. As you sit...Imagine the orange being a symbol for abundance and visualize all that entails for you. Peel the orange and eat the orange. Take your time and thoroughly taste and embody the essence of prosperity as you chew. Rub your hands together and bring them into prayer pose and chant LONG SAT NAMS 3xs on one breath. Sat Nam means "Truth is my Identity." Bring your hands to your forehead and seal the work into your frontal lobe by bringing your hands and head to the floor in front of you. "Feel yourself holding your abundance. The hand is your spirit. It is not your hand you are holding: it is Jupiter, Saturn, Sun and Mercury. The best thing is to know what you have. Sometimes we dont have the power to concentrate and we miss the opportunity. Elementary abundance is in your hand. Your hand will hold it...the breath of life...the breathing prana will be the longest and maximum you will concentrate. That is all that is needed." Hope you are feeling abundant and satiated after this meditation! Dont forget to drop a lil sumthin in the beggars bowl at the top of the blog page if you benefit in any way from Rhythm & Breath. All heart donations go to the research of mystic tools, production of meditation videos, blog maintenance, dissemination of information on Kundalini Yoga & Meditation, and therapeutic processing of the Kundalini rising. Any help you can give is certainly appreciated...I humbly thank you in advance. The Sanskrit name for the 2nd chakra is "Svadhisthana." This word means "dwelling place of the Self." In the lower abdomen, about an inch below the navel. 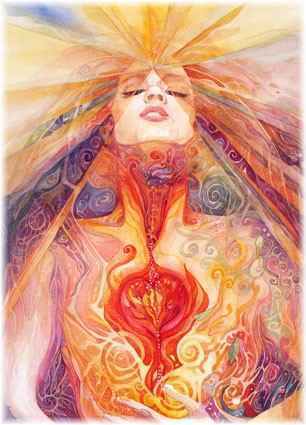 The emotion associated with the 2nd chakra is passion. If you grew up in an environment where emotions were repressed or denied, this chakra may be deficient. Some signs of deficiency are fear of pleasure, being out of touch with one's feelings and resistance to change. 2nd chakra may be overly emotional behavior, sexual addiction or poor boundaries. Excessiveness can be caused by living in an environment where there is a constant need for pleasurable stimulation, such as entertaining or partying. Frequent emotional drama can cause excessiveness also. The element for the 2nd chakra is water, thus the association with the liquids of the body. Water flows, moves and changes. A balanced 2nd chakra allows us to do that also. The color for the 2nd chakra is orange. Orange is a very stimulating color because of its vibrational energy. The sense for the 2nd chakra is taste, especially a sweet taste. The Sanskrit name for the 4th chakra is "Anahata." This word means "unstruck" or "stillness." This seems to imply that deep beneath our brokenness and pain, wholeness abides. The 4th chakra is located in our heart center. It governs our intuition and love. It is also known as the heart chakra. Green and the secondary color is pink. Air. 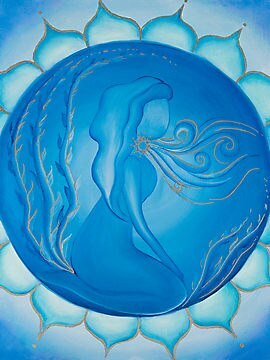 Pranayama practice helps to balance this chakra. Compassion and joy. The 4th chakra feels the suffering of others. Deficient: You may experience feelings of shyness and loneliness, an inability to forgive or a lack of empathy. Physical conditions can include shallow breathing, asthma, and some lung diseases. Excessive: You may experience co-dependency, possessiveness, jealousy, heart problems and high blood pressure. Poses that stimulate the 4th chakra are backward bends (anything that opens the chest). A powerful way to energize this chakra is to love ourselves and others. Manipura in Sanskrit means "lustrous gem." The 3rd chakra is located in the area of the solar plexus, navel and digestive system. It is associated with power, self-esteem and vitality. It is the seat of the intellect. When the 3rd chakra is excessive, anger, hatred, too much attention to power, status and recognition can be present. In yoga, passive backbends are good for calming an excessive 3rd chakra. When it is deficient, one can have digestive problems, eating disorders, low self-esteem and a feeling of powerlessness. 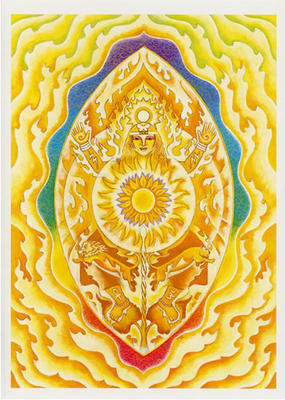 The colors for the 3rd chakra are yellow and gold. The element for the 3rd chakra is fire. When there is too much heat in this part of the body, there can be digestive problems. All of the "itis" diseases begin in this chakra when the fire gets out of control. The emotion for the 3rd chakra is anger.